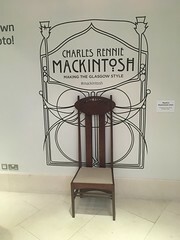 This entry was posted in Art, Art Nouveau, Museum visit and tagged Art Nouveau, Arts and Crafts, Glasgow style, Liverpool, Rennie Mackintosh, Walker Art Gallery by ms6282. Bookmark the permalink. So is this the same exhibition Kelvingrove had last year? It was excellent. I went once and always meant to go back but didn’t. Really neat, glad you were able to visit and share. The art nouveau looked familiar, maybe his or another artist’s but I did recognise the style.